Norfolk Southern gave Democratic and Republican convention attendees tours of its trains and a chance to meet some of its employees without anybody having to walk outside. Through a partnership with agency RP3 and CNN's in-house brand studio, Courageous, Norfolk Southern sponsored three short 360-degree films highlighting various aspects of the company's business in ways that help decision-makers better understand the complexity of the freight rail industry. The movies, which people could view with Samsung Gear VR headsets at a CNN-hosted restaurant next to the convention centers in Cleveland and Philadelphia, let viewers ride atop, alongside or underneath the massive machines in a way that brought them closer than ever before. Bruno Maestri, Norfolk Southern's vp of government relations and corporate communications, said the goal was to help educate convention delegates, policymakers and other attendees while they were gathered in one place. "I think what you want to take out of it is that it's a complex industry and that it takes a lot of people," Maestri said. "We have 30,000 people, and it takes really quality people to make this thing happen." 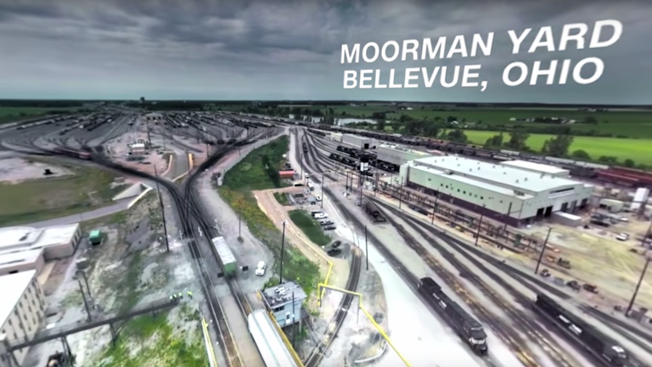 In one movie based at a facility called Moorman Yard, Courageous used drones to shoot 360-degree video from above the vast railyard to show how the trains are transported. According to Otto Bell, vp and group creative director at Courageous, the work had a deliberately "understated tone" and was inspired by the humility and pride of Norfolk Southern's employees, rather than being highly scripted promotional material. Bell sent two producer-directors to the rail yards to find characters who captured the spirit of the company. Equipped solely with voice recorders, the producers conducted interviews with foremen, site managers and others who were on the tracks while also scouting scenes for future shoots. After that, Courageous went back with a larger crew and a 360-degree camera rig. What especially came across, even beyond the visuals, was the earnest nature of the workers, many of whom have worked for Norfolk Southern for decades. Nothing was scripted, Bell said, adding that a lot of the dialogue came from the initial visits. "If you try and script like that, the whole thing falls apart," Bell said. "They're not actors, so don't treat them like that—you'll fail." Now that the conventions are over, Courageous has started a campaign on Facebook targeting local, state and national policymakers across the country, directing them to the videos and a microsite with additional content about the brand and its role in the U.S. economy. "You want to prove to them that they are sort of an indelible part of these communities," Bell said.